As the number of megapixels in iPhones increases. 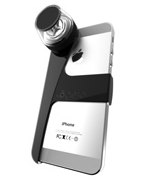 so do the numbers of specialty lenses and accessories created especially for the mobile device. One of the more unusual lenses I’ve come across is the category of panoramic lenses. Now, I’ve seen them in use for still photography, but they’re new to me as an iPhone VIDEO option. But I’ve been pleasantly surprised before by some of the toys that I’ve acquired over the years. Looks easy enough. Let’s give it a bash. Installation is as simple as it gets. Place your iPhone into the harness (which already has the 360ᴼ lens attached to it), download and install the free Looker iPhone app, launch your video recording app, calibrate (simple), then start recording. Once you’ve created your project, you can share it with friends (or enemies, depending the nature of your video) to your favorite social media, via email or post to the company’s website. The Looker app not only presents you with the usual share options, but also has a rudimentary editing feature. You can buy monopods, mounts and other accessories from kōgeto’s online store. You can also purchase the harness in four different colors, as well as different harnesses for different models of iPhone (4/4S/5). You can even buy separate lenses should you would like to have an extra in case you should damage or loose your existing one. To get a feel for what you can do, you can visit the companies website to view some mundane and some very exciting examples to get you started. Yup. Simple. Unfortunately, I’m apparently far simpler than dot as I could not obtain satisfactory results. I made roughly one dozen attempts at creating a test video for this review (recalibrating each time, which the Help file says should not be necessary unless you remove the harness + lens) with nothing to show for it. Half way through, the software went wonky and the record button disappeared, resulting in a complete reinstall, as well. The design of the harness + lens is not very well thought out. They tell you to keep your fingers out of shot but I challenge anyone to accomplish that while holding the whole kit with just your hand. I returned to the website and noticed several fingers in featured videos. If you really want to remove your fingers from view, you’ll need some mount of one sort or another. I was looking at one kōgeto’s competitor’s designs. Not as graceful looking but it appeared to be a lot more practical to shoot with. I haven’t a review model but I’d be willing to give it a try. Even though dot is priced competitively, I felt that the price was high. And as for the accessories, you can find other sellers online who’ll give you a better price. Also, the harness does not come with a 1/4-20 threaded tripod mount built into it. Thereby forcing you to buy a mount of some sort so that you can attach it to a monopod, tripod or what-have-you. And if you want to buy one of the aforementioned replacement lenses, you’re going to have to cough up the same price as you did initially, except now you don’t get the harness! The pricing in general seemed a bit of a “gotcha.” But this is nothing compared to the biggest rotten fish in the barrel. There is an item in the store that I would love to purchase but can’t unless I buy the entire package. That would be the Lucy S.
Lucy S. is a large panoramic lens that you can mount onto a full tripod and run the feed directly into your laptop. Now, that would be some fun! Except for one small problem. Even in its most basic package, you have to buy the Lucy S along with an HP laptop. In case you skimmed over that last sentence, let me repeat – YOU HAVE TO BUY THE LUCY S ALONG WITH AN HP LAPTOP! At the barebones level (HP Ellitebook laptop + Lucy S) it’s a whopping $2,875! There’s not even any specs on the laptop. And, believe it or not, they have a package more expensive than that! So yes, if you want to have a Lucy S, you have to use Windows and buy an HP (without specs) from kōgeto! That’s absolutely shameless! I’m so steamed that I have to type another exclamation point! ! I’d say that if you already have the accessories, and can assemble your own mounts and pods from ones that you already own, go for it if you’re so inclined. Just buy the lens with the harness and give it a go. Otherwise, it’s your money. You decide.